Thousands of people carrying torches gathered in the Latvian capital, Riga to celebrate Independence Day. Praised as a “beautiful” march by the organizers, anti-fascist activists claim the rally has clear signs of the torchlight processions of Nazi Germany. The Latvian right-wing National Alliance (NA) party, also known by the name ‘All for Latvia!’ is behind the torchlight march. In recent years, the rally has become an Independence Day tradition. Latvia declared independence from Soviet Russia in 1918 after World War I. In 1940, it became part of the USSR, and regained independence in 1991. 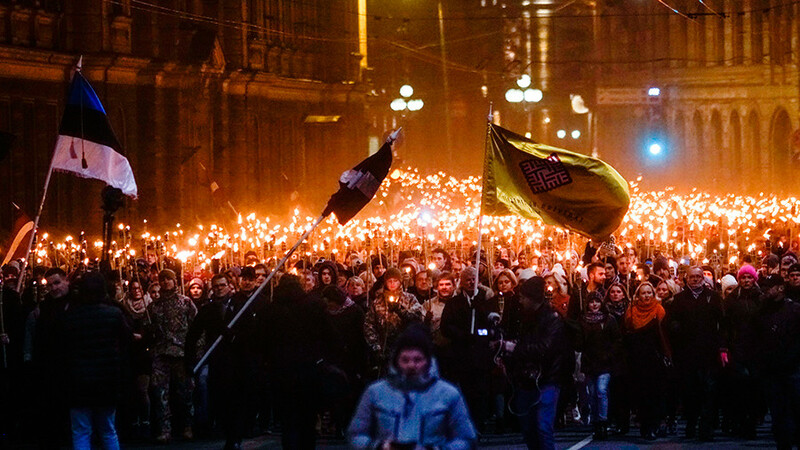 Thousands marched through central Riga on Saturday, torches in hand. While some came prepared, others were provided with free torches by volunteers, RIA Novosti reported. “It is our tradition. It’s beautiful in the first place,” participants told the news agency. Not everyone agrees, however. “We absolutely associate this torchlight march with the ones in Germany in the 1930s,” the co-chair of Latvia’s anti-fascist committee, Josef Koren, told RIA. During the march, “radical nationalistic” slogans can be heard, shouted by participants, he claims. Earlier this week, a Latvian NGO submitted a draft bill to the European Parliament calling for sanctions against politicians involved in promoting Nazi ideology in the EU – including through marches and other public events – to be introduced. The legislation has already been signed by a number of European parties and organizations, including from Hungary, Finland, and Germany, Izvestia reports. The torchlight independence celebration is not the only public event considered controversial by anti-fascist activists. Marches openly celebrating former Nazi collaborators and Waffen SS members have also been held in Latvia. Although the Latvian government officially opposes those rallies, it allows them to take place annually on grounds of free speech.